Hey style lovers, hey! Hope your throwback Thursday is inspiring you in every way to keep moving forward! I've said it before and I'll say it again. Having a closet full of new clothes is not any fun if you cannot remix and reincorporate the old with the new. Recently I purchased this mustard yellow quarter sleeve length dress from H & M and decided to dress it up with bold neutrals...basically dark brown and an emerald green necklace accompanied with a similar color clutch and my fabulous booties that have been sitting still in my closet for a little too long. These were my Christmas gift from my mother in law two Christmases ago and I still love them. 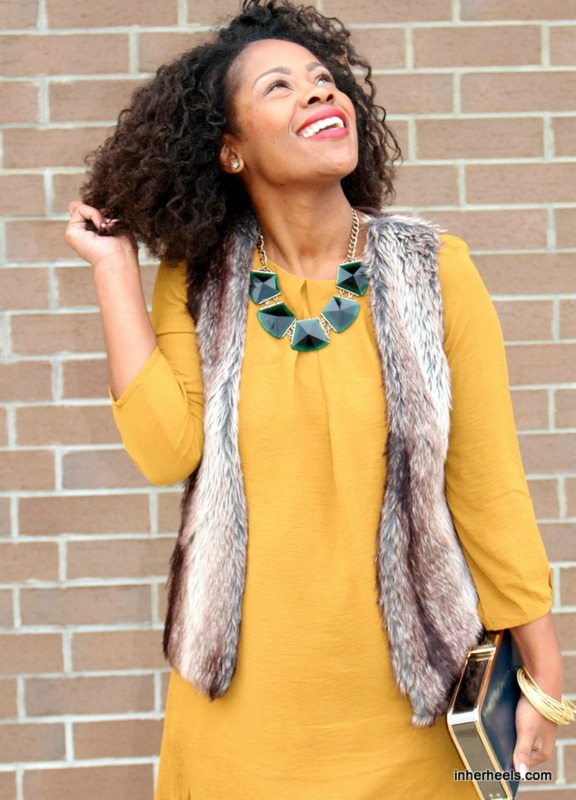 This look can be easily obtained with a basic bold colored dress, faux fur vest, opaque tights to match your vest, fabulous booties, and a bold coordinating color statement necklace. This dress may still be available in stores at H&M. Stay fab! Happy Tuesday style lovers! So I'm getting back into this whole natural hair thing and today I am embracing a wash and go. I washed my hair last night, twisted it in about six big twist and allowed it to dry that way. Wash and go's and shrinkage are total BFF's! Fact is, it took me years to learn to love my hair. I don't think I fully embraced my hair until after my son turned one year old. My hair was at mid back length then but still I often wore extensions. My hair is very thick and I am very tender headed so that would be the reason I am sometimes seen rocking extensions and if it wasn't extensions I would just cut it. You'd have to truly know me to know my hair. Most don't know how much hair is on this head of mine because well they don't know me! [no shade] Ha! So this is the result of my first wash and go of the year!I will get better with it. I've never dyed my hair so you may notice color change as we transition to summer...totally in my DNA. I am too afraid to dye my hair. Lame I know but that's just the way it is. So here's to 2015 and me totally embracing my natural hair. As you can see I'm feeling menswear inspired on the blog lately! I totally love some of the lady looks in menswear particularly when it's subtle. I've had this vest for over a year and I don't think I've ever worn it. This look can be achieved very easily with a faux leather or solid fabric skirt, fitted vest, graphic top, over-sized tote, and chic booties. Personally, I think it makes for a total BOSS look! Ha, I'm loving it! Keep it fab! Link to top below.